Mariette Beco was the oldest of seven children in a poor family that lived mainly on produce from their little vegetable garden. Banneux is a small village at the edge of the Ardennes Mountains. 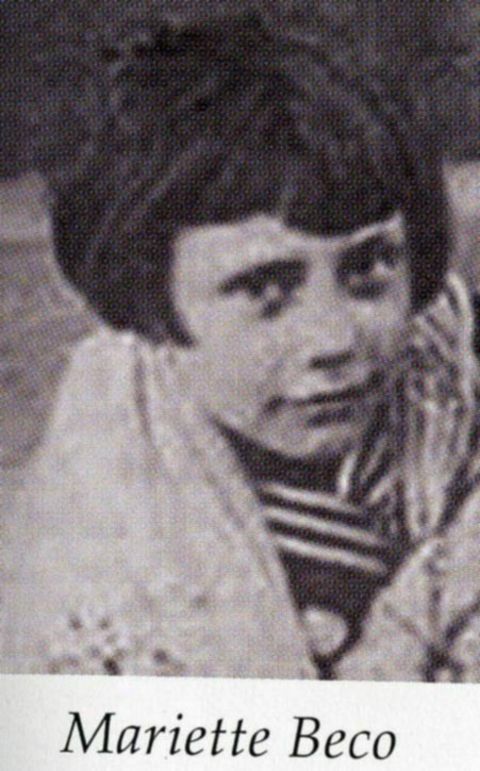 On January 15, 1933, Mariette (11) was looking out the window down the road for her father to return as she watched over two of her ill brothers. As she peered through the curtains into the dark winter evening, she saw a bright glowing shape hovering near the vegetable garden. She rubbed her eyes in disbelief, but a second look now saw the glowing figure of a very beautiful woman, wearing a flowing white gown, white veil, and brilliant blue sash. The woman held a Rosary in her right hand and was nodding and smiling at Mariette. She rubbed her eyes, shook her head, and looked again — but the vision did not go away. She removed a burning oil lamp and placed into the next room, certain that it must be casting reflections. But when she returned to the window, the beautiful glowing lady was still there! She insisted that her mother come see, but she refused. Finally, the mother was persuaded to take a quick look, and she admitted she saw something white hovering over the garden — but none of the other details that her daughter was seeing. She was forbidden to go outside, and the apparition vanished. Visionary Mariette Beco in 1933. At school the next day Mariette told her story to her best friend, Josephine Leonard, who just laughed at her. But Josephine was surprised at how hurt she seemed and began to wonder if there was really something to it. The two girls went to see the parish priest, Father Louis Jamin, after school. Mariette’s behavior and attitude had dramatically changed. She decided now to not skip school as she had been doing, take her studies seriously and prepare thoroughly, and attend the local parish to pray every morning before school. No longer was she a mischievous, unruly, careless truant. Nobody believed her story except her father. It was he who accompanied her to the garden three nights later on January 18 at seven in the evening to observe her next encounter. She suddenly knelt on the frozen ground, started praying the Rosary, and saw the “Lady in white” descending from the sky in the distance. The image was small at first but glowing brightly and getting closer as she floated down between two pine trees. Her father watched in amazement as she raised her arms as if greeting someone. Mariette was delighted at how close Mary was this time — hovering just a few feet above the ground on a small gray cloud of smoke. The site of the apparitions in Banneux in 1933. Mariette did not even know the words “nations” or “relieve” yet, but reported them to the others. Our Lady returned the following evening again, this time stating that she wanted a little chapel built in her honor at Banneux. After this vision, Mariette fainted. The Blessed Virgin did not return for several weeks. Many scoffed at Mariette, teased her, criticized and laughed at her. 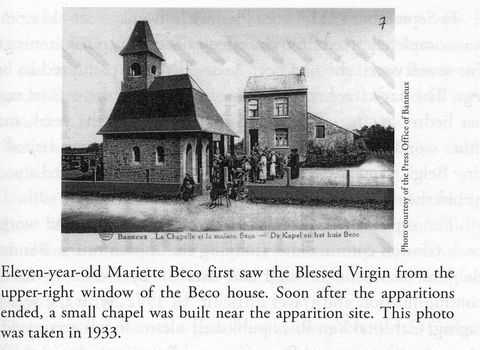 The Virgin Mary begins appearing to Mariette Beco. 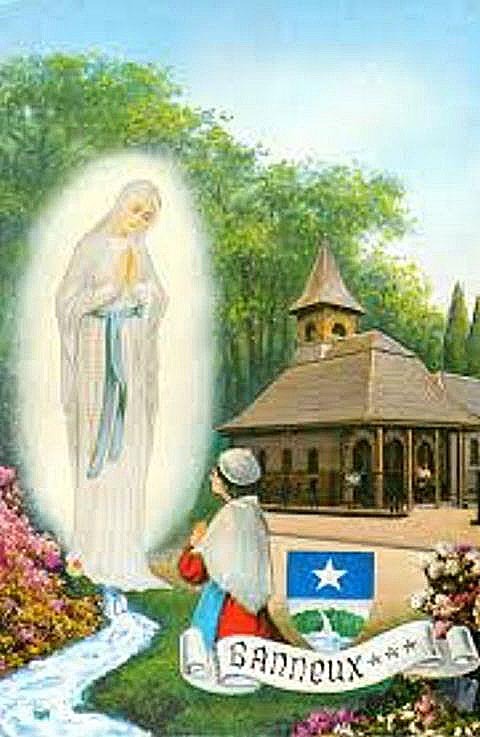 Then on February 11, Our Lady appeared to Mariette and guided her to the spring again. The Virgin Mary also said that ‘it would be pleasing’ to her if Mariette made her first Communion. So she went to Father Jamin, who in turn wanted some kind of a sign that this was really the Virgin. On February 15, Mariette went out into the garden with her mother and a rosary. Immediately, the Virgin appeared, and Mariette quickly dropped to her knees. Blessed Mary leads Mariette to a stream that will heal others. 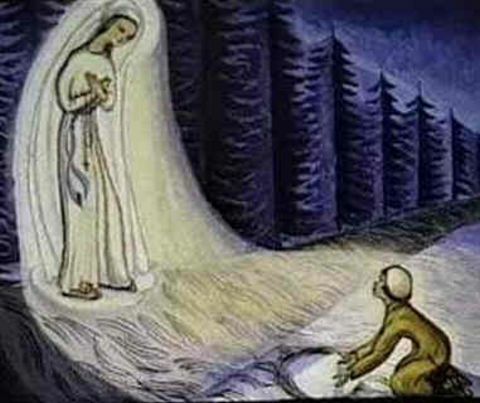 On March 2, in the pouring rain, Mariette returned to the garden at 7:00 p.m. On this occasion of her last apparition, Mary told her, “I am the Mother of God.” Others witnessing these events remarked how Mariette’s speech would become rapid and high-pitched while having conversations with Our Blessed Mother. The Virgin of the Poor in Banneux, Belgium. He withdrew the drain-tube from his arm, and the wound healed immediately in front of many witnesses! Bishop Kerkhof documented at least twenty miraculous cures between 1933 and 1938. A little chapel was built — keeping it small due to Mary’s specific request. It was dedicated on the Feast of the Assumption in 1933. Mariette was interrogated so often that she wished that she had just kept the whole matter to herself, not saying one word about her visions. The house and apparition site today as a place of pilgrimage. During the Second World War, Cardinal Van Roey issued an encyclical in which he declared that the events surrounding the apparitions were worthy of serious study. 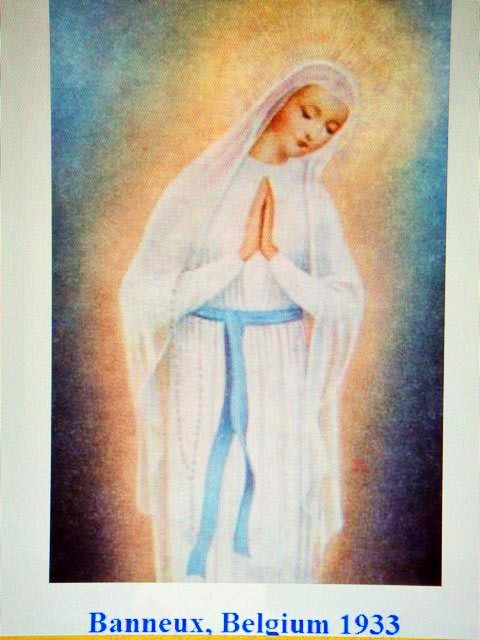 On August 22, 1949, the Bishop of Liege affirmed in a pastoral letter that the eight appearances made by Our Lady to Mariette were to be believed. 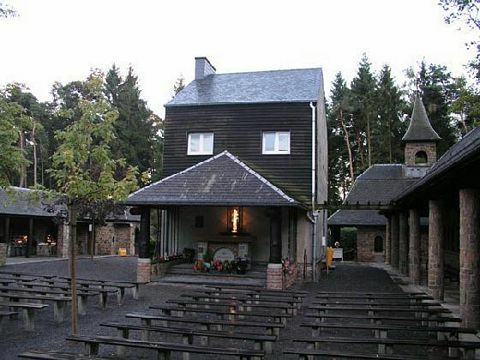 Banneux is now one of the most visited shrines of Our Lady in northern Europe.